At age six Anaxandra is taken by King Nicander to be a companion to his crippled daughter on the island of Siphnos. Anaxandra has adjusted to her new life when, six years later, Siphnos is sacked by pirates, and she is the sole survivor. When a fleet of ships stops on the island to investigate, she assumes the identity of Princess Callisto to survive. The ships belong to Menelaus, king of Sparta, and he takes her back to Sparta with him. But Helen, wife of Menelaus, does not believe that this child is Princess Callisto. Anaxandra manages to stay out of harm’s way—until Paris and Aeneas arrive. When Menelaus and his men depart to attend his grandfather’s funeral, Paris and Helen’s passionate affair plunges Sparta and Troy into war. requested this book from book swap on Goodreads.com . After reading it, I was pleased that the novel barely touched on the war. There are so many thing that I love about this book that I don’t know if I can even fit it all into one review. I normally do not like first person point-of-view, but I think this novel wouldn’t have been the same if it hadn’t been. When it first starts, the main character, Anaxandra, is only 5 years old and, thus, narrates through the eyes of a five year old (who knows how to express herself very well…) As the story progresses and Anaxandra grows older, the way she thinks and talks also evolves. You almost feel as if you grow with her, learning the things that she does and experiencing what she does with such clarity. From page one, the plot unfolds, another thing I adore about any book. There is no unnecessary detail or long drawn out explanations of anything. Cooney wastes no time with excessive writing when she can sufficiently say it in a few sentences. Something I thought was very realistic considering the narrator. It almost reads like a stream of consciousness. It isn’t staccato and rough like Hemingway’s writing, but smooth while still sounding like what is going through a young girl’s mind during the time. The plot actually wasn’t too complicated. A young girl is given to a king as a companion for his daughter. Their village is sacked when she is older and she lies to Menalaus to save herself and thus becomes a companion for his young daughter. Helen then meets Paris, and the rest is history. It sounds simple enough, but every page had something on it that progressed the storyline. It seemed that something was always happening. Cooney’s Helen of Troy had me clutching my book firmly in my claws, trying not to throw it across the room in rage. I always picture Helen of Troy as a narcissistic woman who should have been put in her place. Cooney portrayed just that: a woman so caught in her own supposed birthright, beauty, and self-bestowed power that, at times, Helen acted as if she was a goddess herself. She had accepted her life but was bored with it. It wasn’t until someone as equally gorgeous and captivating as her (Paris) came along did she gain the courage to finally defy her husband. to be quite the stud of his time, just bragged about his conquests and skills, of which in truth, he had none. What is not to love about two people wrapped up in themselves actually falling in love with each other? I wondered if they were only in love with the idea of them having a mate that compared to their unsurpassed looks. shelf instead of donating it once I had finished. It lacks a certain maturity that I had grown use to from the other novels I have been reading as of late, but considering it is a young adult novel, I think Cooney can be forgiven for such a triviality. If you like fiction about ancient Greece and Greek Mythology, I whole-heartedly recommend this little gem. Thanks to my friend Kali over at Gemini Perspective for the inspiration for the novel information format. 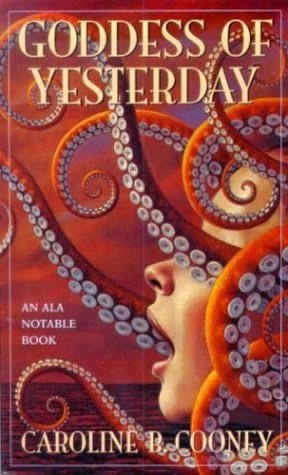 This entry was posted in Books, Reviews and tagged book review, Books, caroline b. cooney, goddess, goddess of yesterday, mythology, reading, review. Bookmark the permalink.